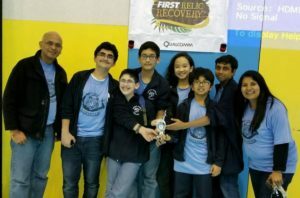 This weekend, the HSE FTC RoboTigers competed in the West Houston League championship and, competing against high school teams, won first place in the design award category! The team also won third place in the motivation award category. Congratulations to Mattin R., Jay R., Ava L., Mirthun M., Scott L., Unsh R., as well as Coach Dhar Rawal for their great success in this tournament.